With the new launches, the company aims to transform technology and user experiences to make devices more productive for consumers. At the company’s annual Tech Life event, Lenovo has unveiled a series of new smart home, laptop and AR devices, which aim to transform technology to make them more productive for consumers. Lenovo Smart Home Essentials is a new family of connected devices that address today’s fragmented smart device landscape. Lenovo’s family of connected home essentials - and the recently launched Lenovo Smart Display - signal the company’s growing and multiplatform AI ecosystem and ambitions in the smart home category. The Lenovo Link app is a centralised control centre to set up and manage all applicable devices, as opposed to an individual app for each device. Users can control specific groups of devices at once or automate them to make certain actions at specific times during the day. Lenovo Smart Home Essentials work with the Google Assistant and Amazon Alexa. Customers can also set up, automate and control various aspects of the home with their voice using the Lenovo Smart Display as a control hub. Lenovo Smart Plug – A small device that can be plugged into any open outlet, letting users control any compatible device that’s plugged into it. Lenovo Smart Camera - A smart surveillance camera that lets you monitor live video footage inside the home—even at night—through infrared night vision. Its built-in mic and speaker allow for two-way audio capability. Lenovo Smart Bulb - A smart light bulb that lets users remotely schedule and customise lighting—adjusting colour temperature and dim brightness, or turning it on and off from anywhere and at any time through the Lenovo Link app. Powered by 8th Gen Intel Core processors, the Yoga C930 is Lenovo’s flagship Windows 10 consumer 2-in-1 laptop, that debuts a Rotating Sound Bar with Dolby Atmos Speaker System. It supports Dolby Vision HDR and the Yoga C930 also features a Garaged Pen that charges in its compartment. Far-range mics enable Cortana and Alexa on the Yoga C930 to recognize voice command from up to four meters away, even in standby mode. Lenovo claims that the new Yoga Book C930 is the world’s first dual display laptop with E Ink. The versatile E Ink screen turns into a customizable keyboard with multi-language support, digital paper for notes or sketching, and even an eReader at the touch of a button. It features Windows 10 and Intel Core processor performance in an ultra-thin and ultra-light form factor and offers great battery life. Also, the Yoga C630 WOS is the industry’s first device to be powered by Qualcomm’s latest Snapdragon 850 Mobile Compute Platform. It features integrated LTE Advanced Pro with up to 25+ hours of local video playback. The Yoga C930 and Yoga Book C930 will be available in EMEA from the end of September with a starting price of €1,499 (about Rs 1,24,034) and €999 (about Rs 82,661) respectively. Availability for the Yoga C630 WOS is November with a starting price of €999 (Rs 82,661). 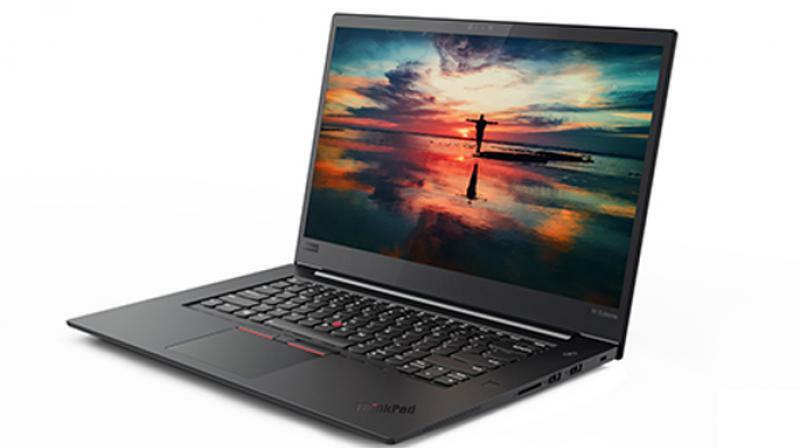 Lenovo’s new ThinkPad X1 Extreme features a discrete NVIDIA GeForce graphics and the latest 8th Gen Intel Core processors featuring integrated Gigabit Wi-Fi, which includes Core i9. The multi-monitor support enables multitasking and RapidCharge technology charges the battery up to 80 per cent in 60 minutes. Its also comes with a 4K, 100 per cent Adobe RGB colour gamut display with Dolby Vision HDR and Dolby Atmos audio. Security features include ThinkShutter camera cover, Windows Hello facial recognition, and touch fingerprint reader. The ThinkPad X1 Extreme will be available in EMEA from September with a starting price of €1,695 (about Rs 1,40,247). Yoga Chromebook - This new Chromebook features up-to-4K, near-edgeless, touchscreen display with the performance of 8th Gen Intel Core processors, SSD storage, DDR4 memory, and up to 10 hours of battery life. Availability is the end of October in EMEA with a starting price of €799 (about Rs 66,112). Lenovo Chromebook C330 - The Lenovo Chromebook C330 features a 10-point touchscreen IPS display for easy viewing in tent, tablet, stand, or laptop mode. It provides automatic updates to protect users from the latest malware while performance via powerful processing with integrated graphics and eMMC storage—all with up to 10 hours of battery life. Availability is November in EMEA with a starting price of €349 (about Rs 28,876). Lenovo Chromebook S330 - Featuring up to an FHD anti-glare IPS display, the Lenovo Chromebook S330 is designed to stay up to date. It has LPDDR3 memory, an additional 100GB of cloud storage and eMMC storage for quick boot-ups and multitasking. Availability is November in EMEA with a starting price of €279 (about Rs 23,074). Lenovo L27m monitor - A 27-inch Full HD, near edgeless wide-viewing display, this monitor can power your devices, reduce wire clutter and simultaneously enable fast, easy data transfers and connections over a single cable with the versatile USB Type-C port. Availability is the end of November in EMEA with a starting price of €279 (about Rs 23,074). Lenovo Legion Y530 Laptop with NVIDIA GeForce GTX 1060 upgrade - It is slim and sleek for mainstream gamers on the go, and it comes with 8th Gen Intel Core processors and has NVIDIA GeForce GTX 1060 GPUs. Availability is October in EMEA with a starting price of €1399 (about Rs 1,15,748). Lenovo Legion T730 and C730 - The Lenovo Legion T730 VR-ready tower and the compact Lenovo Legion C730 both get a performance boost, real-time ray-tracing in games and powerful AI enhanced graphics with up to the NVIDIA GeForce RTX2070 and RTX 2080 GPU refreshes (and up to RTX 2080 Ti GPU on the Lenovo Legion T730). The Lenovo Legion T730 is a 28L powerhouse wrapped in a chassis with a transparent side panel revealing an array of customizable RGB lighting, while the Lenovo Legion C730 is a 19L cube with overclocked components. Both continue to feature up to 8th Gen Intel Core i7 processors for incredible gaming performance. Availability is November in EMEA with a starting price of €1999 (about Rs 1,65,422) for the Lenovo Legion T730 with GeForce RTX 2070 refresh, and €2699 (about Rs 2,23,349) with the GeForce RTX 2080 refresh. The Lenovo Legion C730 with GeForce RTX 2070 refresh starts at €1999 (about Rs 1,65,422) and with GeForce RTX 2080 starts at €2699 (about Rs 2,23,349).